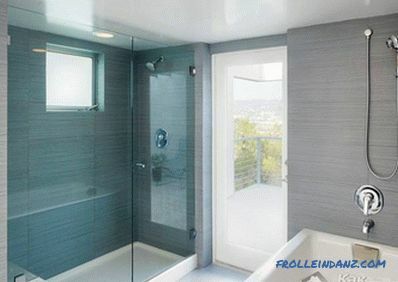 It is quite difficult to choose a high-quality finish for surfaces in the bathroom, since all materials must have good water-repellent properties and must not undergo changes due to sudden temperature changes. 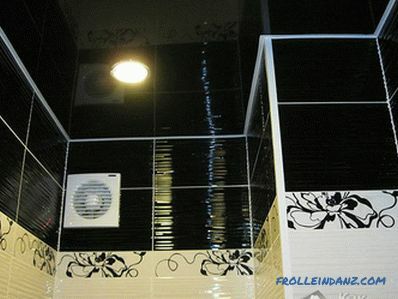 If you can look at the walls and floor tile, then it will not work for the ceiling. 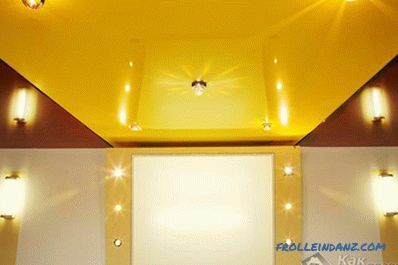 Recently, stretch ceilings, which in all their properties and characteristics are excellent for a kind of room microclimate, have become increasingly popular. 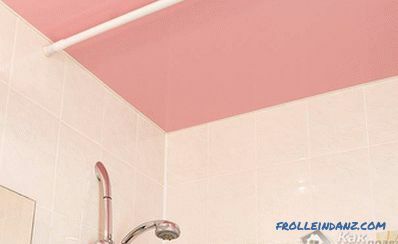 It is worth noting that the design of suspended ceilings in the bathroom can be very diverse, so everyone can choose the appropriate option. Moisture resistance. All moisture that falls on the surface of the PVC film in the form of droplets and steam accumulates and falls down or dries. In this case, there are no traces or streaks. Durability. 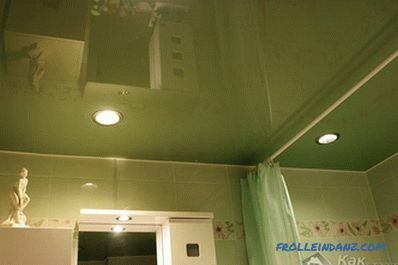 Neither the high humidity of the air, nor sudden temperature drops have any effect on the film, therefore, with proper installation and proper maintenance, the ceiling will last more than 15 years. 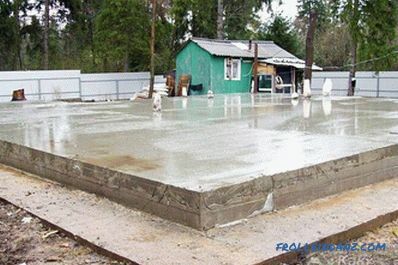 Protection against flooding. If we are talking about a multi-storey building, there is always the risk of flooding from above. In the case of the stretch canvas, you can not worry about this, as a strong film does not miss moisture. 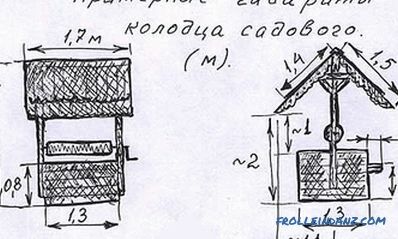 The film will gradually sag under the weight of water (not more than 100 liters), it will be enough to drain it and return the film to its place. Easy care. Materials used for installation are absolutely antistatic, so that the surface does not collect dust. 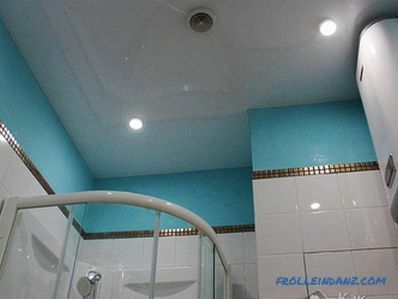 To clean, just wipe the ceiling with a damp soft cloth. Extra space. The design provides free space that can be rationally used. 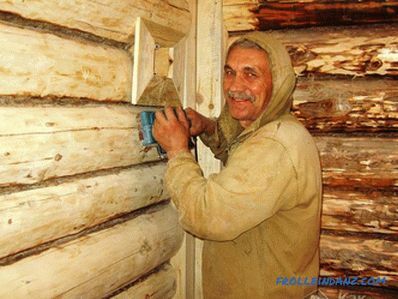 Very often, communications are hidden here or they install insulation. Gloss. The best option for rooms with a small area. All light will be reflected, increasing the space. The main thing is to choose the right lamps. The best option are considered point embedded elements. Matte shade. It will perfectly complement the classic interior of rooms, which implies rigor and conciseness. It can be equipped with absolutely any type of fixtures. Textured canvas. This is a complete imitation of stone, wood and leather. 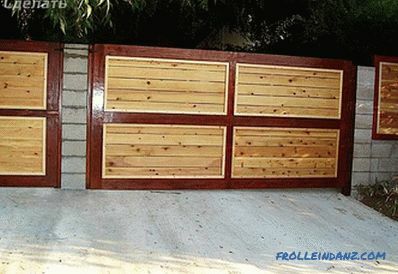 If this option will be well combined with the decoration of walls and furnishings, then it should be applied. 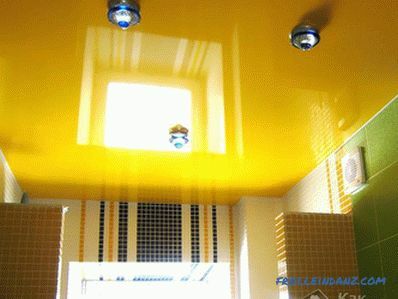 For example, for a bathroom in an oriental style, a red stretch ceiling with gold ornaments would be best. Now you can proceed to the consideration of color solutions. White is the traditional solution for all styles and trends. 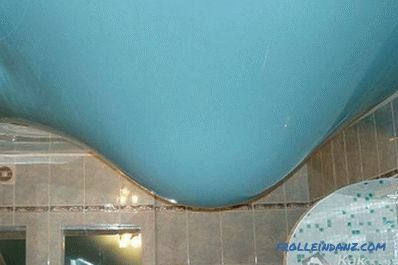 Most of all, it is suitable for a minimalist bathroom. Light tones will visually lift the low ceiling. These include pistachio, pale pink, light green and sandy shades. Lightness and lightness will give pale pink. 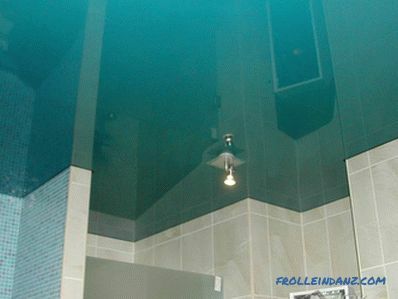 Sea shades are a common color palette for the bathroom. A lot of color combinations can also be attributed to the element of water, but most often they use blue, emerald, turquoise and other blue-green shades. 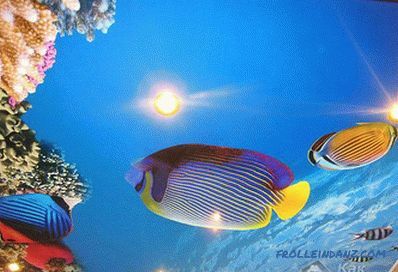 Images of sea creatures, such as fish, seaweed, or a tropical island, can complement such a picture. Bright tones. This is a non-standard option for decorating the bathroom, as it is not associated with peace and tranquility. 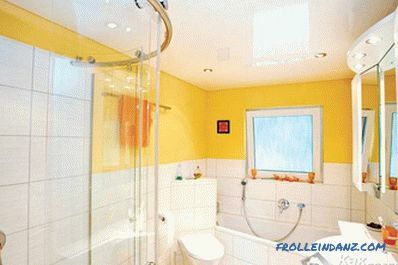 At the same time the inclusion of rich and deep colors in the interior of the bathroom is also permissible. In order to correctly enter such a ceiling into the interior of a room, it is necessary to study all variations, combinations and ideas. 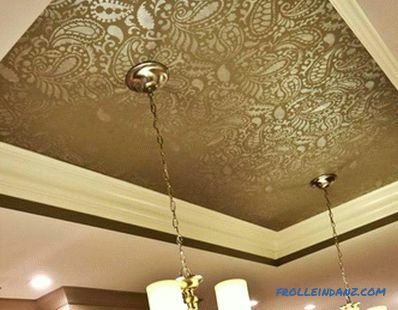 For example, when choosing red for the ceiling, it is worth including this color in the wall decoration. Black. 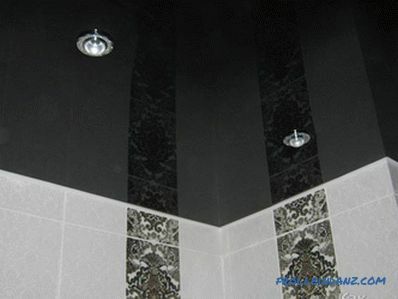 In this case it is necessary to include dark elements in the finish for the walls. To draw a harmonious line, it is enough to use white plumbing and furniture. In tone tile. No less common and popular option, but if not properly planned, the general view will be too bland. 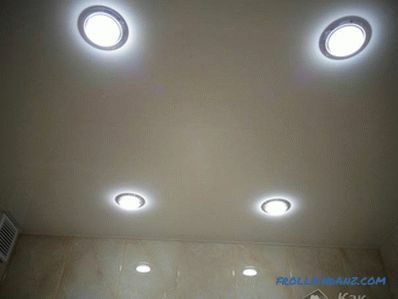 To the result was not boring, it is recommended to supplement the ceiling with spotlights. 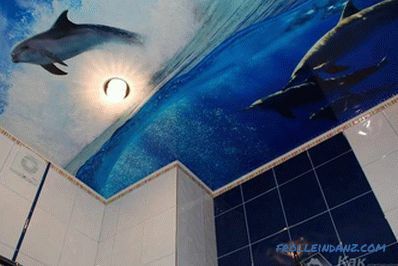 The original solution to decorating the bathroom stretch ceiling is to use a three-dimensional image - 3D -picture. 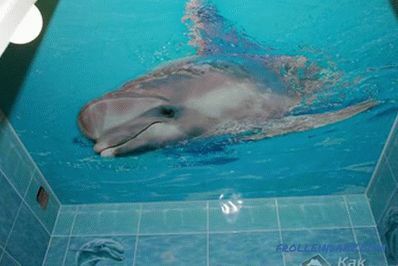 So, during water treatments, you can enjoy the unusual sea landscape or the starry sky. If necessary, you can use a frieze to delimit the space, which will be contrasted with the background tile.If we are talking about images and drawings, then it is the frieze that will act as a frame. As a result, you can get something in the role of the picture. When combining several colors, it is recommended that one of them choose white, since it effectively combines with all shades. 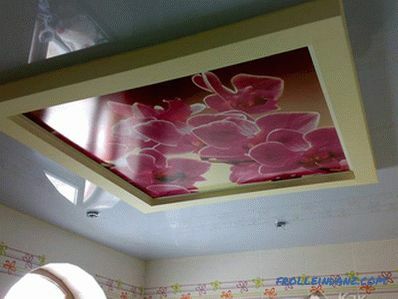 Cloth fabric can also be used to design the ceiling in the bathroom. 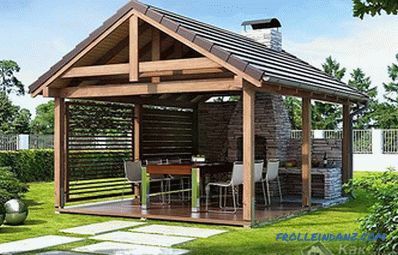 This was made possible due to the inclusion of polyester, impregnation with a polyurethane mixture and coating with a finishing varnish. So, the material gets the same water-repellent properties as the film. When choosing a fabric also should not be limited. The choice in this case is great: drawings, patterns, hieroglyphs, as well as photos. In the latter case, you can place an individual order in specialized firms. In order to minimize the influence of moisture and high temperature, it is necessary to organize high-quality and abundant ventilation. 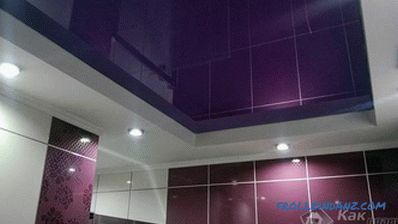 Positive reviews indicate the high popularity of suspended ceilings and their positive properties. 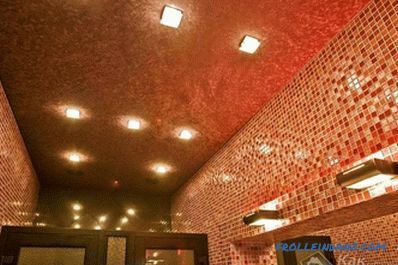 Once you have decided on the type of stretch ceiling and picked up the best design option, you can proceed to direct installation.